Hello - are you still out there? I'm not doing a very good job keeping this blog alive, but once in a while I feel inspired to write a post. Talking about inspiration - the theme for this year's 'The Refashioners' challenge is 'Inspired by...(take your pick). For the 6th time Portia of Makery is hosting this great challenge, where the participants are challenged to refashion unloved garments into hopefully loveable ones. Today I'm the blogger in the spotlight. Do yourselves a favour and check how the other participating bloggers have worked their magic on some unwanted garments. One word. Wow. They are so good! Just look at Toya's amazing embroidery skills. I'm in awe. And how about them ruffles on Kate's new dress?! I want that dress (but I'll let Kate keep it because I couldn't wear it half as well as she does). Well, back to little old me. I chose to let the fabric do the talking for me. 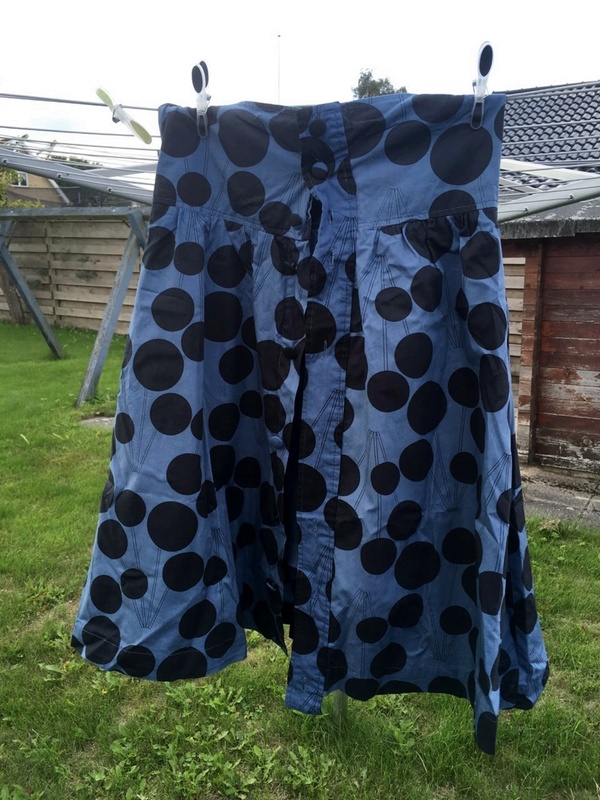 I found this women's skirt at one of my local thrift shops - and I gladly paid the 40 DKK for this print. It was one of those garments that caught my eye the minute I entered the shop - and I immediately thought 'Motoreta'. For those of you who are not familiar with the brand, it's a Spanish based company offering children's wear. I love their simple, comfortable yet interesting and unique designs. Just as Kate above I have a thing for ruffles and flounces - and so does Motoreta. I turned the paneled skirt into a top for Wilma. 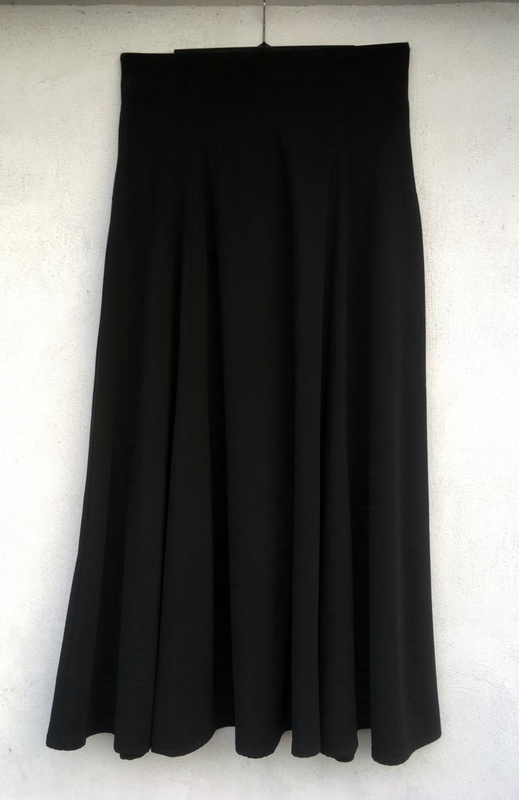 I wanted to make the flounce from the same fabric, but because of the panel shapes I would need to piece the flounce and I wasn't sure how it would drape if it had extra seams, so I chose to make the flounce from the skirt's lining (the blue) and paired it with the black crepe from one of my own skirts that I butchered for this purpose. A Gabriola skirt I made years ago - and haven't worn in about 3 years since it's to big. Another paneled skirt that gave me a challenge. I had hoped to make ankle length trousers for the kiddo from the fabric, but that just couldn't be done, so instead I made her shorts inspired by the pants. The top is self drafted - and the shorts are based on Toya's (yes the same Toya) 'The Graphite Trousers'. 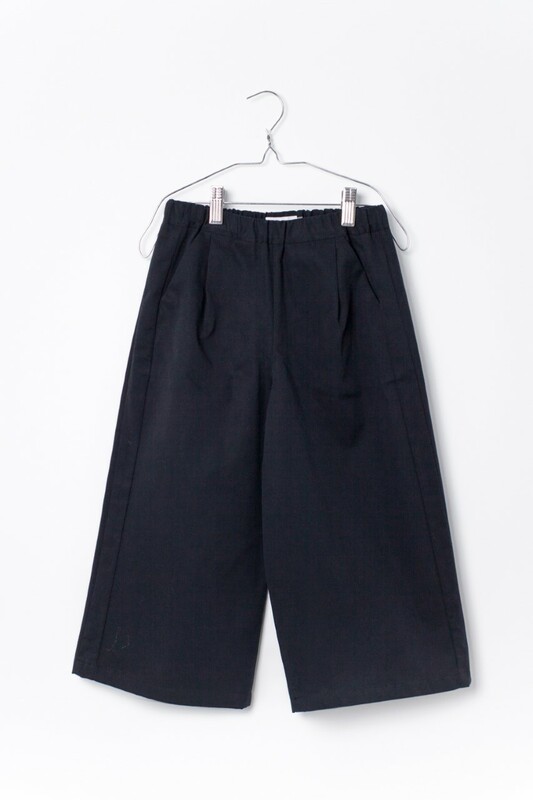 My original plan was to hack the pattern a bit to make the wider legged 'Cala' inspired trousers. The shorts are just as Toya drafted them. My inspiration for the top is the 'Mariana' - I just added a back zipper (that I removed from my Gabriola skirt) instead of a v-back and buttons. Since autumn has found it's way to Denmark consider this outfit her first for summer 2019. Never have I been that well prepared before. Hope you like it - and thank your for inviting me, Portia. After an almost 5 months long hiatus I'm back. I'm not planning on blogging on a regular basis again, but this little project deserves some spotlight! Chat Chocolat has just released a new fabric collection called 'A Terrace in Memphis'. This collection includes lovely printed and solid knit fabrics. My favorites are the solid jersey tencels, but the summer sweat fabrics are beautiful as well. Véronique from Chat Chocolat generously offered me to try some of the fabrics from this new collection and I chose the black jersey tencel you see below and a rust brown colored one as well which I'll present on my Instagram profile in a day or two. As much as I wanted to keep the fabrics for some selfish sewing, I instantly knew that they would be perfect for gorgeous, soft summery clothes for my kiddos. Youngest kiddo once again ran with all of it, and to see the look on her face when I first showed her this dress was priceless. My baby girl is no longer a baby girl. 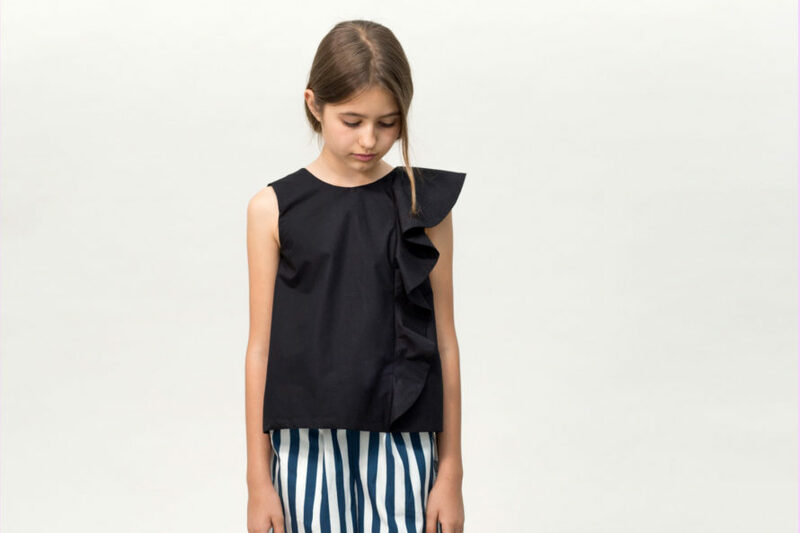 She is slowly turning into a young, beautiful woman, and this design paired with the solid tencel jersey is just right in every way for a tween. The pattern I used is the Calli Sundress by Bebekins Patterns. The largest size is 10 which my tall 11 year old has long outgrown, but I figured that if I used jersey (the pattern is designed for woven fabrics) and just lenghtened the bodice and skirt some it would work for my slender kid - and as you can see I was right. I removed some width from the skirt and altered the shape of armholes a tiny bit - and then the lengthening mentioned above - that's it. Look at that back. Le sigh. If only I was 20 years younger I would make something similar for myself. It's absolutely breath taking if you ask me. Wilma agrees with me. She can't recall me making her anything prettier. You could see how proud and elegant she felt, when she wore this at her summer school party last week - and my heart melted. I feel so blessed that my kids still very much appreciate what I make for them. I'm just about to finish a simple, lovely high school graduation dress for my first born. Just at she prefers it. Do you know Belgian based textile designer Lotte Martens? She designs and handprints beautiful and unique fabrics at her own atelier in Leuwen or in collaboration with European partners and every step in the production process is completed with greatest care. Some months ago I was kindly asked if I would be interested in joining a Lotte Martens fabric Blog Tour. Didn't need to think twice about that offer. The hard part was to pick the fabric for my project - as there are so many beauties to choose from. At the moment you can only buy Lotte's fabrics at European shops - but soon you'll be able to buy from non European shops as well. For my project I chose the gabardine fabric 'Koperen Regen' (Copper Rain) - a beautiful copper colored rectangle/square 'rain' print on a dark navy blue background. I used one panel (60 cm x 145 cm with the print beeing on one half of the 145 cm width) and 1 metre of the corresponding uni colored gabardine for Wilma's new jacket. I had initially planned for some selfish sewing with the fabric - that was until my kiddo caught a glimpse of that copper print....heart eyes all over place. The sturdy material is perfect for bags and outerwear so we agreed on some sort of coat - and preferably a simple design to highlight the beautiful fabric. I browsed through my collection and finally found just the right pattern. A design from the Japanese sewing book 'Casual Sweet Clothes'. The patterns in the book are designed for women. Small women. My 10 year old is almost 160 cm tall and just the height these patterns are designed for so I figured the smallest size would fit her - and right I was. The fit is spot on. The jacket is based on the patterns D and Q from the book. As you can see I used the copper print for the back of the unlined jacket. The hood is supposed to be lined, but I just couldn't find the right fabric for the lining (and I was out of the main fabric) so instead I finished the seams with bias tape. Now I wish I had finished all seams with tape. The jacket has cropped raglan sleeves and patch pockets. Closes with zipper and one button. Unfortunately the jacket isn't suitable for the current cold Danish weather - but it'll be perfect for spring time. Thank you so much for inviting me Lotte and Eva. Almost four years ago I participated in The Little Betty Top tour hosted by the pattern's designer Sew Pony. Betty has gone through some changes and is now called Issie - but she's still the same great easy fitting strech top but now with even more options to choose from. She can be made with or without ruffles, with or without ribbing or even with a little tie collar - and comes with instructions for a dress length as well. We adored her back then and love her even more now. I made Wilma a size 12 cropped sweatshirt version in french terry from The Sweet Mercerie. I kept the ruffles but instead of a waistband I lengthened the bodice a bit (more at the back) and made tiny side seam splits. I also omitted the neckband and instead of folding the right side towards the wrong side of the fabric I did it the other way around and topstitched. I also sewed the ruffles on top of the bodice with two rows of stitches and left all the edges raw. I like this edgy touch paired with the girly ruffles. The sleeves. I added width and length to the bottom and turned them into balloon/bishop style sleeves. 2017 - year of the sleeve. Thanks for inviting me dear Suz - it's always a pleasure.